If the astronomers had been properly grounded (in EU concepts), they would not have been shocked. Large ring as nova remnant ? Depends on one's definition of a nova, doesn't it? Meanwhile, Birkeland's experiments with the terrella generated toroidal plasma rings. Besides, the "rings" of novae are imagined to be an optical effect—the outer edge of a spherical bubble seen from a distance. The big ring around Saturn is a ring or torus, not a sphere. Are you describing a 'Super nova'? Mightn't a brown dwarf/gas giant have a more controlled dissipative event, as a nova ? Especially if the body is orbiting with another system. nova energy out equatorially, as seems to be the radiative pattern of our present sun ? In this thread are several links to theories about the source of Saturn's rings. I have a another suggestion. A well known theory* proposes that the planets were once, not too long ago, in a polar configuration with Saturn. The same theory also speaks of plasma streams joining the planets, and streaming up to Saturn, forming the spokes of "the wheel of heaven", according to ancient testimonies. Now couple that with the fact that Mars' northern hemisphere is excavated miles deep. So, having lost a significant proportion of it's rocky crust, and, if it had any water, has lost that also. So the material removed from Mars could be the source of Saturn's rings. This would also explain why they look so brand spanking new. Saturn’s icy moons, as well as its famous rings may only be hundred million years old, suggesting they formed during the reign of many dinosaurs. This would date the formation of the major moons of Saturn, with the exception of more distant Titan and Iapetus, to the relatively recent Cretaceous Period, the era of the dinosaurs. 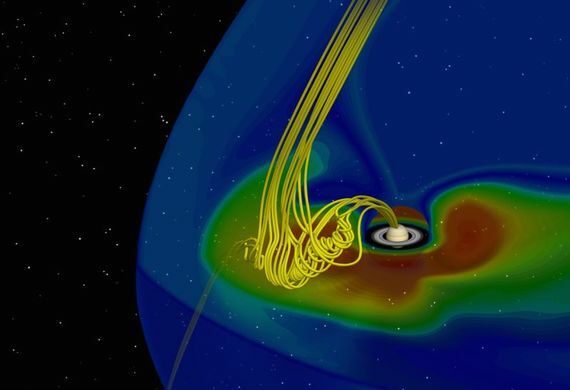 Magnetic reconnection is being used to explain the presence of magnetic ropes, or flux transfer events (FTEs), connecting the Sun and Saturn. On the news, new close ups of Pan, moon of Saturn. So I googled it to find out more. Pan is one of Saturn’s shepherd moons, clearing out a 200-mile-wide space in Saturn’s rings known as the Encke Gap. In January, during a flyby of Daphnis, another of the shepherd moons, Cassini was able to successfully take only one photograph. And I read the caption with the picture. On reading that I thought, what? 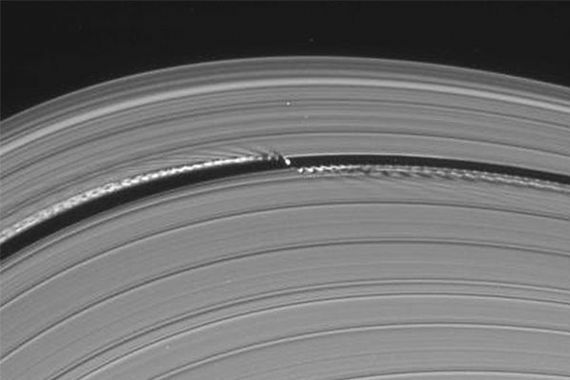 "gravity opened a gap in the rings". Gravity is a force of attraction. Isn't it? I think it must be Daphnis' (and Pan's) electric field that clears the dust in it's orbital path, by repelling it. Yea NASA/JPL, et al, uses gravity like duct tape. Gravity "clears out" everything. Really? Saturnian ring gaps are not created by "gravity." The rings, like the planet body, is a harmonic body created by EM vibration. Several posts dealing with an off topic subject have been moved to a more appropriate thread here. It does seem rather odd to consider these tiny moons clearing out a ring gap by gravity [analogous to say Jupiter or Saturn clearing out heir local orbits by attracting a large entourage of hardware into their vicinity in the form of satellites, Trojans, etc. ], especially considering that other Panish-sized moons are seen rather to be discharging material to form rings! If it were true (clearing out a ring gap by gravity) then we already had examples of gravitational waves. Pan and Atlas, and other shepherd moons may be clearing their respective orbital paths, but it would seem to be more of an electrical effect, "waking" as they do the ring material ahead as well as behind in their revolution, by what appears to me as a repulsion and rebounding oscillation. How about those new Cassini pics of Saturn's North Pole ?